Hospice Residence in Sylvania, Ohio. She was born in Fremont, Ohio on August 27, 1926. Janet married the love of her life, John William Simmons, in July of 1951. John, a veteran of World War II passed away in 2014. Janet is survived by three children. Carol Greenberg (Carlos Carvalho), Barb (Lee) Domschot and Bob (Lynn) Simmons. Janet has five granddaughters. Nellie Greenberg, Heather (Randy) Kersey, Rachael (Bryce) Paule, Karen (Michael) Porter and Erica Simmons (fiancé Jacob Goins). Her four great grandchildren are Canon and Caleb Porter and Reed and Autumn Paule. Janet was a volunteer at Epiphany Lutheran Church in Toledo, where she tirelessly coordinated many events including Rotary luncheons and meals for people in need. 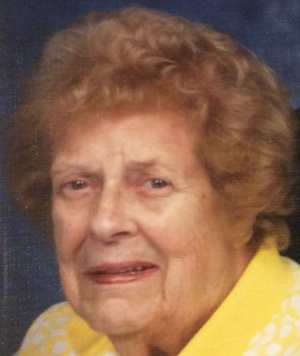 Her biggest joy in life was spending time with her husband, grandchildren and great grandchildren; including attending their various sporting events. Janet spent her last two years as a resident at Lakes of Sylvania Senior Living Center. She made many friends there, attended Happy Hours, outings, and shopping sprees. Family would like to thank all there who assisted Janet with her daily life and supported her in times of need. Services will be handled by Thos. I. Wisniewski Funeral Home, 2426 N. Reynolds Rd, Toledo, Ohio. Visitation will be held there Thursday, March 28 from 2pm until 8pm. Services will be held on Friday, March 29, at Epiphany Lutheran Church, 915 N. Reynolds Rd., Toledo Ohio, at 11am. Family will be available for greeting at the church at 10am. Family requests in lieu of flowers, donations to Ebeid Hospice in Sylvania, Ohio; or Epiphany Lutheran Church. Janet will be greatly missed and is now in the loving arms of The Lord with John by her side.